Frederick Austin Reynolds, was aged 21, working as an electrical engineer at the Chowder Bay Submarine Mining Station in Middle Harbour, Sydney. From Queenscliff, Fred was also a young lifesaver with the Manly Seagull Club. Fred’s last letter to his parents was published in the Australian Press in July 1915. Source: National Archives of Australia. Fred was buried at Shrapnel Valley Cemetery (Plot I, Row C, Grave No. 17), Gallipoli, Turkey and his name honoured on a memorial cross featured at the site. 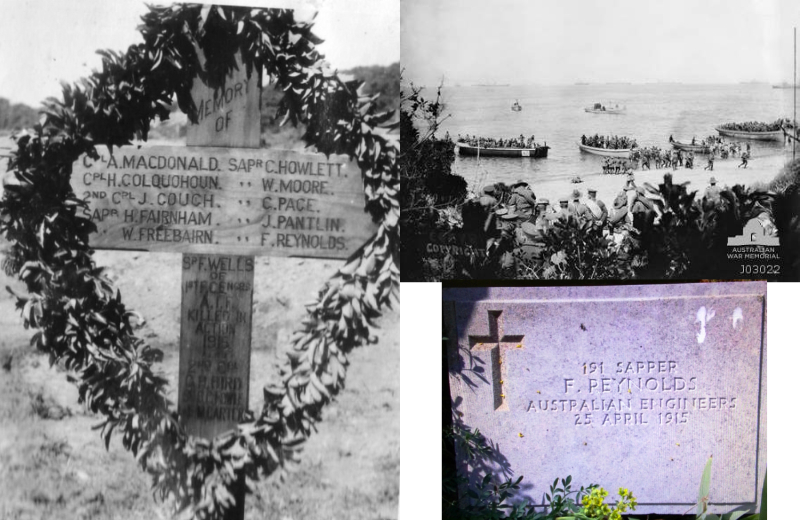 In the top right picture above of the Gallipoli landing, taken at 8.00am on 25 April 1915, Fred is the lone body lying on the beach. 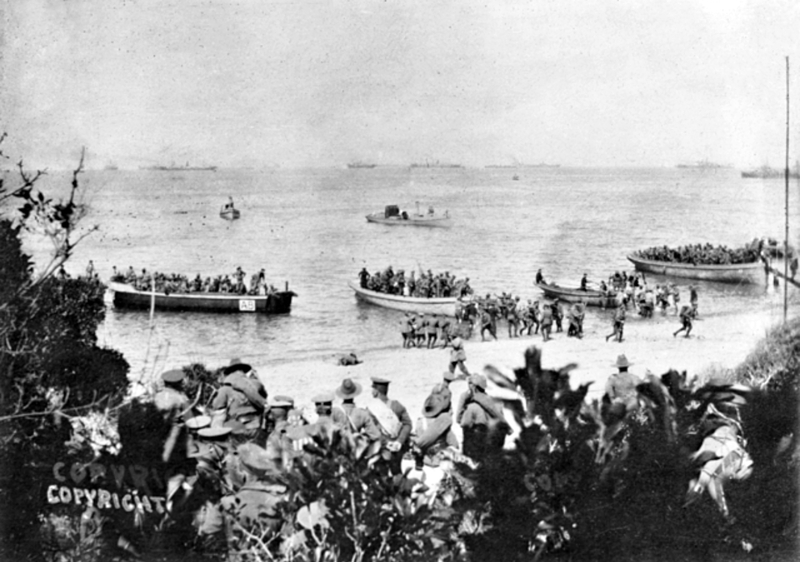 Landing at Gallipoli at 8.00am, 25 April 1915. AWM A01090. At the water's edge lies Australian engineer, Sapper R Reynolds, the first to fall. Good turnout at Bondi yesterday for the dawn service. 1803 – Thousands of meteor fragments fall from the skies of L'Aigle, France; the event convinces scientists that meteors exist. Scientists didn’t believe in meteorites until 1803. In the early afternoon of 26 April 1803 a meteorite shower of more than 3000 fragments fell upon the town of L'Aigle in Normandy, France. Upon hearing of this event the French Academy of Sciences sent the young scientist Jean-Baptiste Biot to investigate that spectacular fall of stones. After painstaking work in the field he reported two kinds of evidence pointing to an extraterrestrial origin for the stones: 1. Physical evidence: the sudden appearance of many identical stones similar to other stones fallen from the sky in other places, and 2. Moral evidence: a large number of witnesses who saw a "rain of stones thrown by the meteor”. Artist depiction of the event. A complete slice of a fragment of the L'Aigle meteorite, approximately 10 grams. Biot's passionate paper describing how these stones must undoubtedly be of extraterrestrial origin effectively gave birth to the science of meteoritics. The L'Aigle event was a real milestone in the understanding of meteorites and their origins because at that time the mere existence of meteorites was harshly debated. 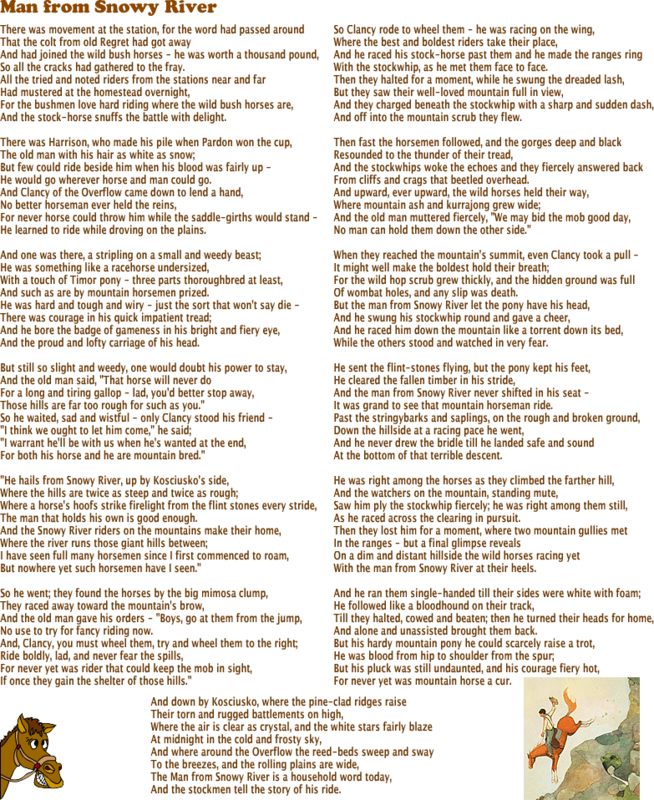 "The Man from Snowy River" is a poem by Australian bush poet Banjo Paterson. It was first published in The Bulletin on 26 April 1890, and was published by Angus & Robertson in October 1895, with other poems by Paterson, in The Man from Snowy River and Other Verses. The inspiration for "The Man" was claimed by Banjo himself to be not one person but a number of people. The poem tells the story of a horseback pursuit to recapture the colt of a prizewinning racehorse that escaped from its paddock and is living with the brumbies of the mountain ranges. Eventually the brumbies descend a seemingly impassably steep slope, at which point the assembled riders give up the pursuit, except the young protagonist, who spurs his "pony" down the "terrible descent" and catches the mob.Two characters mentioned in the early part of the poem are featured in previous Paterson poems; "Clancy of the Overflow" and Harrison from "Old Pardon, Son of Reprieve". Love this man's work, part of an Australian era never to return. 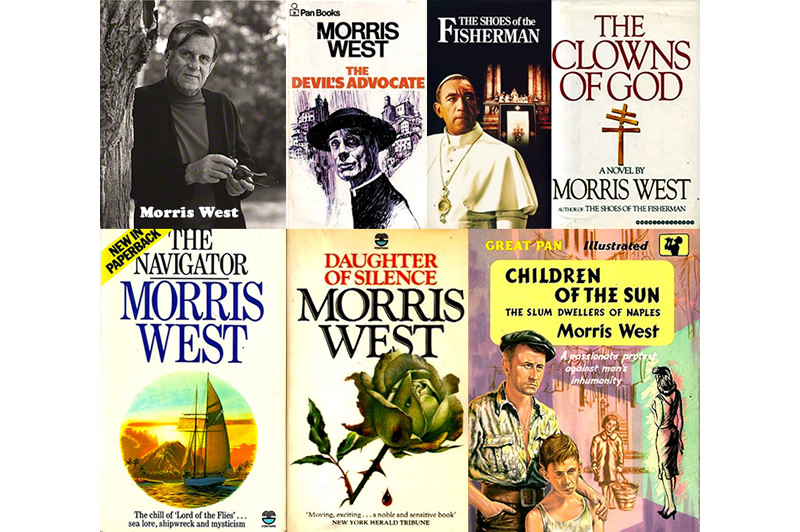 Morris Langlo West AO (26 April 1916 – 9 October 1999) was an Australian novelist and playwright, best known for his novels The Devil's Advocate 1959, The Shoes of the Fisherman 1963 and The Clowns of God 1981. His books were published in 27 languages and sold more than 60 million copies worldwide. Each new book he wrote after he became an established writer sold more than one million copies. A major theme of much of West's work was a question: when so many organisations use extreme violence towards evil ends, when and under what circumstances is it morally acceptable for their opponents to respond with violence? He stated on different occasions that his novels all deal with the same aspect of life, that is, the dilemma when sooner or later you have a situation such that nobody can tell you what to do. West was born in St Kilda, Victoria and attended the Christian Brothers College, St Kilda. At the age of fourteen, he entered the Christian Brothers seminary "as a kind of refuge" from a difficult childhood. He graduated from the University of Melbourne in 1937 and worked as a teacher in New South Wales and Tasmania. He spent 12 years in a residence of the Christian Brothers order, taking annual vows, but left in 1941 without taking final vows. That same year, he married and enlisted in the Royal Australian Air Force. He was seconded from the RAAF to work for Billy Hughes, former Australian prime minister, for a time. After becoming well known for producing radio serials, he left Australia in 1955 to write and lived in Austria, Italy, England and the United States, finally returning to Australia in 1980. During this time he was the Vatican correspondent for the Daily Mail from 1956 to 1963. His son said that he spent his first 12 birthdays in 12 different countries. The wedding of Prince Albert, Duke of York, and Lady Elizabeth Bowes-Lyon, later Queen Elizabeth The Queen Mother, took place on 26 April 1923 at Westminster Abbey. In an unexpected and unprecedented gesture, Elizabeth laid her bouquet at the Tomb of The Unknown Warrior on her way into the Abbey, in memory of her brother Fergus. Ever since, the bouquets of subsequent royal brides have traditionally been laid at the tomb, though after the wedding ceremony rather than before. Wedding photo, 26 April 1923. Combined coat of arms of Albert and Elizabeth, the Duke and Duchess of York. Prince Albert initially proposed to Elizabeth in 1921, but she turned him down, being "afraid never, never again to be free to think, speak and act as I feel I really ought to". When he declared he would marry no one else, his mother, Queen Mary, visited Glamis to see for herself the girl her son wanted to marry. She became convinced that Elizabeth was "the one girl who could make Bertie happy", but nevertheless refused to interfere. At the same time, Elizabeth was courted by James Stuart, Albert's equerry, until he left the prince's service for a better-paid job in the American oil business. 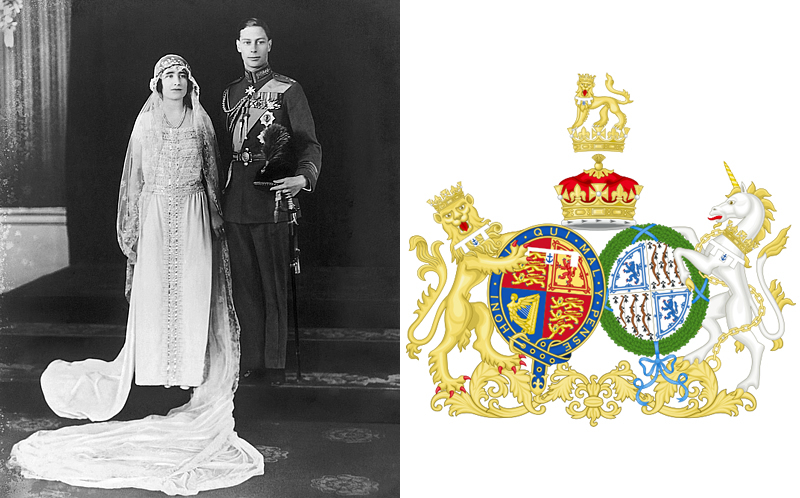 In February 1922, Elizabeth was a bridesmaid at the wedding of Albert's sister, Princess Mary, to Viscount Lascelles. The following month, Albert proposed again, but she refused him once more. 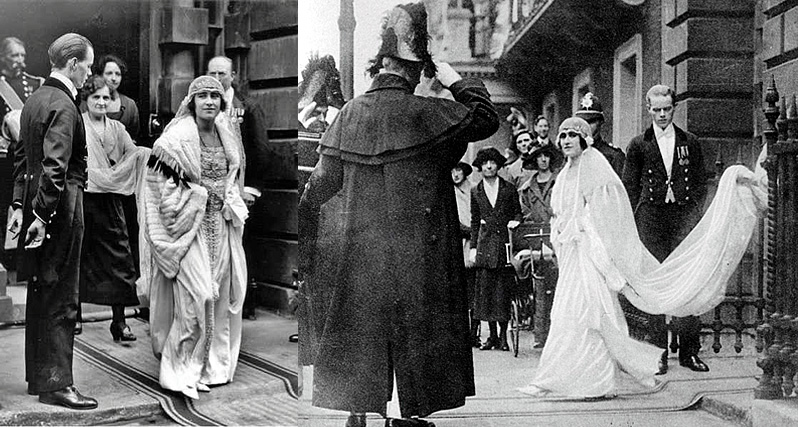 Eventually, in January 1923, Elizabeth agreed to marry, despite her misgivings about royal life. Albert's freedom in choosing Elizabeth, not a member of a royal family, though the daughter of a peer, was considered a gesture in favour of political modernisation. Previously, princes were expected to marry princesses. The Queen Mother on her 100th birthday. 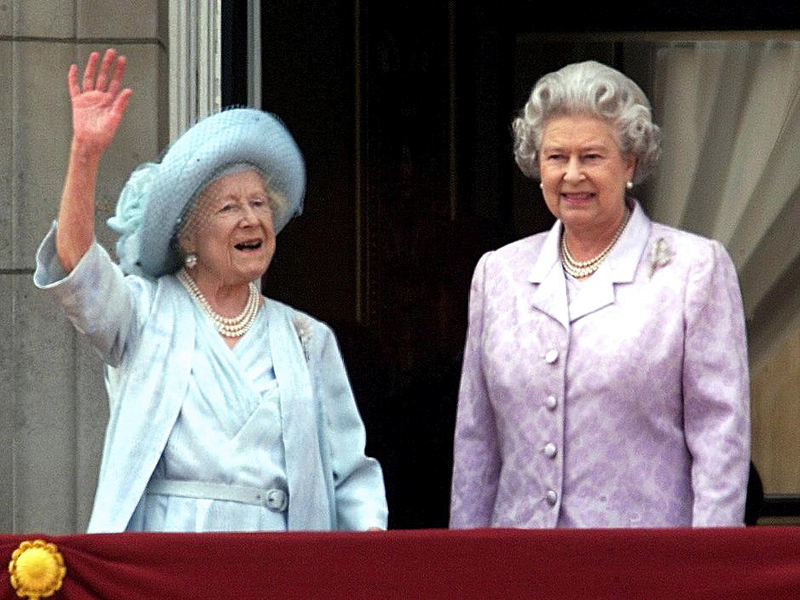 Queen Elizabeth II stands next to The Queen Mother as she waves to the crowds from the balcony of Buckingham Palace on her 100th birthday, 4 August 2000. On 30 March 2002, the Queen Mother died in her sleep at the Royal Lodge, Windsor Great Park with Queen Elizabeth II at her bedside. She had been suffering from a cold for the previous four months. At 101 years and 238 days old she was the longest-lived member of the royal family in British history. 1924 – An explosion on the SS City of Singapore, berthed in Port Adelaide, South Australia, kills 3 people. The cargo ship City of Singapore was loaded with a shipment of cars and tractors from America and a large quantity of flammable cargo, including kerosene, lubricating oil and 38,000 cases of petrol, which in those days was transported in cans. On 26 April 1924, one of the ship’s officers saw flames coming from a ventilator. The local fire brigade was ill-equipped to deal with such a disaster, and fire crews from all over Adelaide moved in during the night to assist. Driver Albert Greenman, a brave and likeable ex-soldier, was among the party called from the Semaphore firefighting unit. SS City of Singapore fire. After the fire. State Library of SA. The hold was flooded and the fire apparently contained. Shortly afterwards an explosion threw some of those on the boat onto the wharf and others escaped by climbing through portholes ahead of the flames. Greenman was found lying on the deck with dreadful head injuries and was dead on admission to Port Adelaide hospital. Eleven firemen and two of the ship’s personnel were taken to the hospital injured. Firemen George Anderson and Jim Hickey disappeared. A monument erected over the grave of George Anderson and James Hickey. Monument Australia. 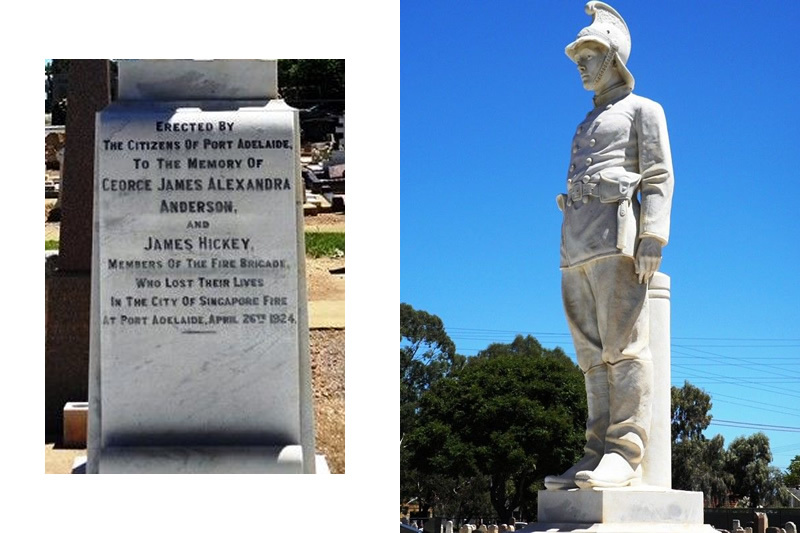 James Hickey age 22, single of the Adelaide Fire Station and George James Alexander Anderson age 23, single of the Port Adelaide Fire Station were buried together in a distinctive grave at the Cheltenham Cemetery. 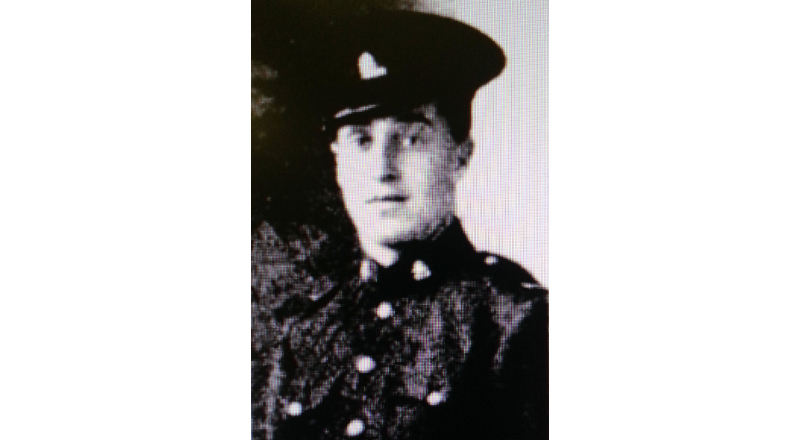 The other victim, Albert Greenman age 29, ex-1st AIF soldier and recently married was buried by his own family at the West Terrace Cemetery. Sir Robert Gordon Menzies, KT, AK, CH, QC, FAA, FRS (1894–1978), was an Australian politician who twice served as Prime Minister of Australia, in office from 26 April 1939 to 29 August 1941 and again from 1949 to 1966. He played a central role in the creation of the Liberal Party of Australia, defining its policies and its broad outreach. He is Australia's longest-serving prime minister, serving over 18 years in total. Robert Menzies was born to James and Kate Menzies in Jeparit, a town in the Wimmera region of northwestern Victoria, on 20 December 1894. He was the fourth of six children. Menzies's formal education began at Humffray Street State School in Bakery Hill, Ballarat and later he attended Wesley College in Melbourne. After leaving school, Menzies studied law at the University of Melbourne, graduating in 1916 with First Class Honours in Law. He then became one of Melbourne's leading lawyers. Family photo taken on the bank of the Wimmera River, L to R: Miss Annie Drendel, helper to Mrs Menzies, brother Les, father James, brother Frank, Robert, mother Kate and sister Isobel. Article in Melbourne Punch detailing Menzies's feat of topping the state school examinations at the age of 13. In 1928, Menzies entered state parliament. He was Deputy Premier of Victoria from 1932 to 1934, and then transferred to federal parliament, subsequently becoming Attorney-General and Minister for Industry in the government of Joseph Lyons. In April 1939, following Lyons' death, Menzies was elected leader of the United Australia Party and sworn in as prime minister. He authorised Australia's entry into World War II in September 1939, and in 1941 spent four months in England to participate in meetings of Churchill's war cabinet. On his return to Australia in August 1941, Menzies found that he had lost the support of his party and consequently resigned as prime minister. He subsequently helped to create the new Liberal Party, and was elected its inaugural leader in August 1945. Declaration of War Broadcast, September 1939. Australian Prime Minister, Robert Menzies, with his British counterpart, Sir Winston Churchill, London 1941. 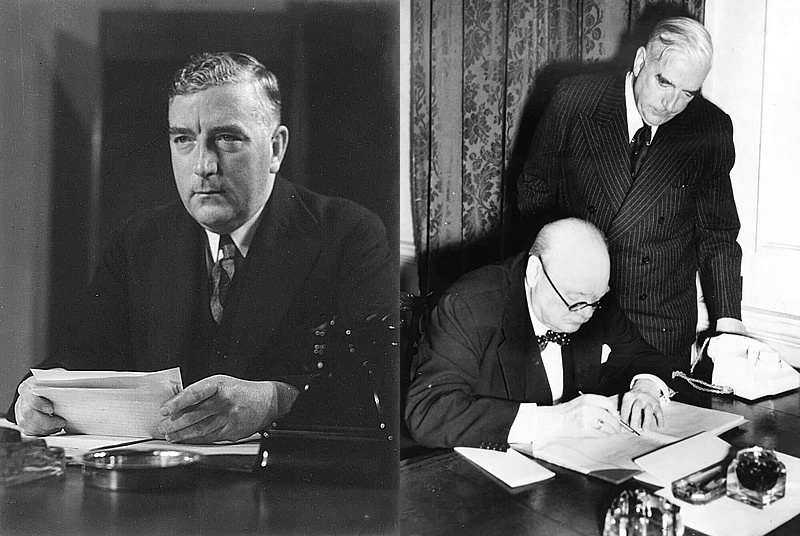 At the 1949 federal election, Menzies led the Liberal–Country coalition to victory and returned as prime minister. Menzies won seven consecutive elections during his second term, eventually retiring as prime minister in January 1966. His legacy has been debated, but his government is remembered today for its development of Canberra, its expanded post-war immigration scheme, its emphasis on higher education, and its national security policies, which saw Australia contribute troops to the Korean War, the Malayan Emergency, the Indonesia–Malaysia confrontation and the Vietnam War. More: Wikipedia. Menzies Virtual Museum. The results of the Federal elections in September suggested that the nation was not solidly behind the government: the restored coalition and the Labor Party emerged with even numbers, and Menzies held office by the grace of two Independents. 1970 – Queen Elizabeth II opens the National Carillon in Canberra, a gift of the British government commemorating the establishment of the national capital. The National Carillon is a striking 50 metre tall architectural landmark carillon, situated on Aspen Island in central Canberra. The carillon was a gift from the British government to the people of Australia to commemorate the 50th anniversary of the national capital, Canberra. It was officially opened by Queen Elizabeth II on 26 April 1970. Carillons must have at least 23 bells to be considered as such, and the National Carillon has 55. Each bell weighs between seven kilograms and six tonnes. The carillon is in regular use, chiming every quarter-hour and playing a short tune on the hour along with tours and recitals on many days. National Carillon. Terry McGee and Jesse Rowan who maintain the National Carillon. They tune the massive array of bells and have been responsible for their upkeep for over twenty years. Carillonists play the suspended stationary bells from a keyboard of wooden batons and pedals, called a clavier. A system of individual cables and wire linkages draws soft iron clappers on to the bells as each wooden baton or pedal is struck by the carillonist. All styles of music are played, from compositions specially written for the Carillon to popular song arrangements and improvisations. The National Carillon is large by world standards and one of only two in Australia. More: Wikipedia. Video: Waltzing Matilda on the National Carillon, Canberra. 1986 – A reactor accident at the Chernobyl Nuclear Power Plant in Ukraine creates the world's worst nuclear disaster. The Chernobyl disaster, also referred to as the Chernobyl accident, was a catastrophic nuclear accident. It occurred on 25–26 April 1986 in the No 4 light water graphite moderated reactor at the Chernobyl Nuclear Power Plant near the now-abandoned town of Pripyat in northern Ukraine. The abandoned city of Pripyat with the Chernobyl facility visible in the distance. Atmospheric Spread of Chernobyl Radioactive Cloud, 4 May 1986. On 26 April 1986, reactor four suffered a catastrophic power increase, leading to explosions in its core. As the reactor had not been encased by any kind of hard containment vessel, this dispersed large quantities of radioactive isotopes into the atmosphere and caused an open-air fire that increased the emission of radioactive particles carried by the smoke. Unlike the nuclear crisis in Japan which was caused by a natural disaster, the explosion and fire at the Chernobyl power plant on April 26, 1986 — the world's worst nuclear accident — was caused by human error.